So, I hope everyone survived Rosa’s fury with minimal to no leaks! So what’s new with you? I like that many of you respond to my blasts – it keeps us in touch. Thanks! What’s new with me….I’m going to have grandchild #3 in March and I’m excited. Except they live too dang far away. But it’s a great reason to travel. Lou and I will host our first house guests since we moved to Wilhoit. His brother and wife are coming to see the Arizona sights. Otherwise, I work a lot. Yarnell Fire District, Model Creek School, Directing the Cantata, Musician and Grant Consulting Business. That’s why it takes me awhile to send these in the first place! 1. This Saturday, October 6th – 5pm to 8pm – Yarnell Fire Station, 22558 Looka Way, Yarnell: It’s a Wine Tasting, Cheese Appetizers and Jazz by yours Truly. Fundraiser! Sponsored by the Yarnell Fire Auxiliary, we’re going to have fun. Come see us at the Fire Admin Building to get your tickets in advance. $15 per person, $25 per couple. Gonna be a good time. Linda Ma, Auxiliary Chair, has a way of transforming a fire station into a classy bistro. You’d never know they keep apparatus in there. Check it out. 2. Friday, October 19th – 5pm American Legion Post 79 Country Style Rib Dinner by the fabulous John and Shawna Shelley, with music by Yarnell’s talented Walt Eckes and his equally talented buddy John! They start playing at 6:30. 3. Friday, October 19th – 4:30 to 7:30 VFW Post 541 in Prescott, Fall Fiesta Mexican Style Fun. Open to the Public $11 pre-sale! I’ll be playin and stayin. 4. Friday, October 27th – Mark the calendar – I’ll be playing at the American Legion Post 79 Halloween Party. For that, you will receive details soon! Well, that’s a wrap. Hope to see you soon and I’ll pass along Halloween Info soon. I hope your summer was amazing! Mine was fast, because time flies when you’re having fun – and when you’re busy. I had a great time playing at the annual Lohrwood Stock on Labor Day weekend. It was nice to have a fun crowd and play in Yarnell! 1. TONIGHT, September 7th: I’ll be playing at the VFW Post 541 Steak Dinner Dance from 4:30 to 7:30. Dinner may be sold out, but you can stop by as our guest at the bar – let us know! 2. TOMORROW NIGHT, September 8th: Join us at Augie’s Restaurant from 5:30 to 7:30, reservation recommended. 3. SATURDAY, October 6th: Join us from 5pm -8pm Wine Tasting, Cheese Appetizers and Jazz! 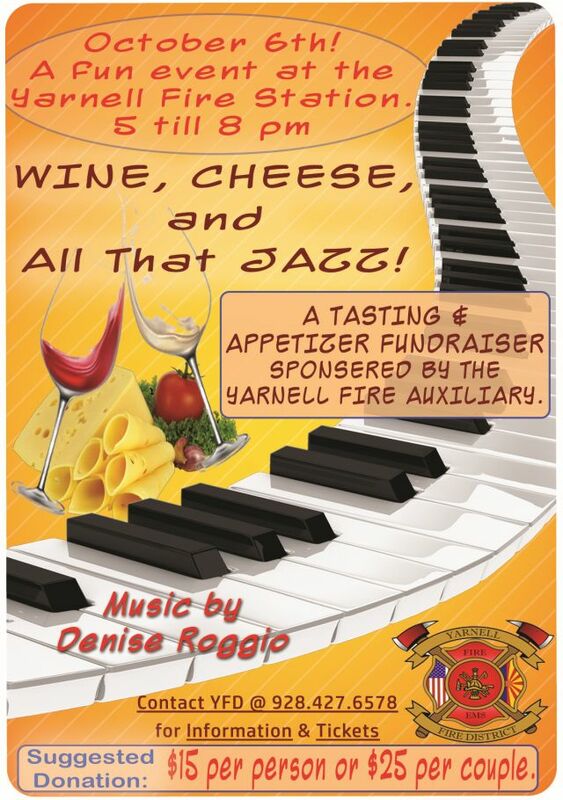 I’ll be playing for the Yarnell Fire Auxiliary’s fundraising event at the Yarnell Fire Station. Suggested donation: $15 per person, $25 per couple. Do you swing dance? We’re looking for someone to coach us for a fun filled evening. Join us at the Crown King Saloon for a Post July 4th Party! How have you been? I haven’t emailed in a while – I took a trip to visit family back on the SNOWY East. The visit was fantastic though it was cold. Otherwise, who else seems to have work/life balance issues? I can’t be the only one. But honestly, I have been a “too-busy girl”. 1. This Friday, April 6th – Come on up to Prescott and eat at Augie’s Restaurant – I’ll be playing from 5:30 to 7:30. 3. Wednesday, April 18th – The Model Creek School students will showcase their talents for the School’s Volunteer Luncheon. I’ll send details in the next few days! 4. Third Fridays at the Yarnell Family Diner might not have music, but we still shout out to the Birthday Babies! ALSO! Everyone is welcome to attend the Coalition for Wildfire Adapted Communities Pancake Breakfast on April 14th. This will be a fun-food event. Southern Yavapai Fire Department, 9000 Magby Dr. in Wilhoit, one block from Hwy 89. 8am – 11am. The Yarnell Fire Auxiliary and friends are cooking a feast. An interactive presentation will be given by members of the Arizona Fire Adapted Communities organization of Greater Flagstaff. Suggested Donation $10/adult and $5/child. May 19th, Yarnell Daze – the music will be everywhere! My stage had a cancellation from 1pm – 1:45pm – it’s a volunteer gig. Any local takers? First come, first serve! ALSO – Walt Eckes, aka, “Strings Attached” will be playing at the Wickenburg Country Club soon – I’ll give you the scoop when I get it. Alright, friends. Have a great rest of your week. This Friday, April 6th from 5:30 – 7:30, I’ll be performing at Augie’s Restaurant, Prescott. Join us for great food and music. 2. Next Friday, March 9th from 6pm – 9pm, Be our guest at the Wickenburg Elks Lodge 2160. Music by yours truly! Restaurant style dinner and huge dance floor. 3. I have the privilege of being the music teacher at Model Creek School. The students are preparing for the Spring Talent Show – I’ll give you full details next week. 4. Mark Your Calendar for May 19th – Yarnell Daze! I’m going to highlight the Vendor’s Field Stage since I’m the stage manager. We’re lucky to have so much local talent in the area. You’ll definitely want to check this out. The stage is located on the corner of Happy Way and Highway 89. 5. March Birthday Night at the Yarnell Family Diner is the 16th! Birthday Babies get a free dessert, and we play Trivia. I try not to repeat all that information, otherwise people would be bombarded with the same information. But you REALLY need to be on that list if you’re interested in Yarnell/Peeples Valley info! I sure hope 2018 doesn’t fly by, because 2017 sure did! Hope this note finds you healthy and well! In December, I performed 15 out of 31 days. Needless to say, I’m taking this month practically off – the voice needs a break. It was a ton of fun though! Here’s some scoop for the next few weeks. 2. Friday, January 19th – Third Friday Birthday Night! 5pm – 8pm, I’ll play that night at the Yarnell Family Diner. We start birthday festivities around 6pm: Trivia and Free Birthday Baby Dessert! 3. Friday, January 26th – Manzanita Road – AKA Terry – will perform from 5pm -8pm at the Yarnell Diner. 6. Saturday, February 3rd – There’s a B-Wear Chic Fashion Show at the American Legion Post 79 – Lunch at 11:30am with a Chef’s Salad Bar – call Becky at 928-231-4875 – This benefits the Margaret David Scholarship Fund. Lou and I wish you a very Merry Christmas Season. Hope you’re all doing well! 3. Saturday, December 9th – I am excited to play for the Christmas Parade of Lights at the Saloon in Crown King! 5. Thursday, December 14th – I’m Celebrating my 50th that day with a Gig at the Prescott Valley Elks. 7. Saturday December 16th Community Christmas Cantata, 6:30pm – Yarnell Community Presbyterian Church. I am so honored to be the director for “The Spirit of Christmas” All are welcome! 8. Thursday, December 21st, 5:30pm – Winter Concert by the Model Creek School Students – in the school Auditorium. That’s plenty for our calendars, right? I’ll keep you posted again soon. Heads up for a fun weekend! It starts with Friday, November 10th from 5pm – 8pm “Strings Attached” brings the tunes at the Yarnell Family Diner. Also, Friday, November 10th from 6pm -9pm I’m playing at Elks Lodge 2160, Wickenburg. Then join me on Veteran’s Day! Saturday, November 11th Augie’s Restaurant, Prescott – I’ll be playing light jazz & blues from 5:30 to 7:30. Manzanita Road will be playing both November 17th and November 24th at Yarnell Family Diner for dinner. I’m taking a family related hiatus for a week. Lou and I wish you all a fantastic Thanksgiving Holiday. It is hard to believe we are barking up the end of the 2017 tree! I realized today that there are less than 9 weeks until Christmas – where is it going?? 2. Also, Tomorrow, October 27th – I’m playing at the Elks Lodge 330 in Prescott Valley, 5:30 – 8:30. They serve a full dinner, and have a great dance floor! 4. Saturday, November 4th – 8am, Pancake Breakfast at Yarnell Fire Station, hosted by the Yarnell Fire Auxiliary. Come learn why we need to become Fire Adapted! You’ll be glad you did…. 7. Saturday, November 11th – I’m SO excited to play at Augie’s Prescott – Augie has been so good to Yarnell Fire and various events; maybe you can stop in that night (Yarnell Rally, anyone?). I’ll be playing jazz and blues from 5:30 – 7:30. Veterans or military, show your card for a 10% discount. The food at this place will rock you. On that NOTE, pun intended, I look forward to seeing you. Thanks for supporting the town’s music performers. “Yarnellians” are notably good supporters, friends, fans and tippers!